Last weekend the Fedora Project was present at the Chemnitzer Linux Tage 2017. This was my last stop during my trip to Nullcon 2017 and the Amrita University. This year’s presence of Fedora at the CLT wouldn’t be possible without the help of Robert, Stephan, and Miro. People are still looking for live media and stickers. And you can still use a Raspberry Pi with Fedora 17 to show a slideshow of screenshots. As the 3D printer didn’t arrive till late Saturday afternoon we cover the addition space with swag. My workshop on Sunday morning was not so much about Fedora but more about Home Assistant. 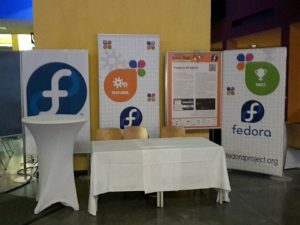 As all participants brought along their own machine only two wanted to use the Fedora Live media. I was a bit surprised of the amount of people who attended. At least for me Sunday Morning doesn’t seem to be the time to go to a workshop. Anyway, we spend some time to work around the usual installation issues like missing requirements, installations while the venv is not activated, and alike. Unfortunately, I packed to much stuff in the workshop. The idea was to focus on automation rules because of I needed to go very fast through the integration part to have some spare time before lunch. After Home Assistant was awarded with the Thomas-Krenn award I was back on Fedora duty and spent the rest of the afternoon to talk to visitors. I also had the chance to speak people from booths around us. We found out the people across from of us made the indoor tracking system of the public transportation operation in my city.